We recommend booking pre-trip accommodations if you'd like to fully immerse yourself in Reykjavik's vibrant atmosphere. Arrive at Reykjavik-Keflavik International Airport (KEF) before 7:00 am where you’ll meet your Trip Leaders and new friends. Take included transportation to Reykjavik for breakfast and take a walk around Iceland's quaint capital city. Depart for our basecamp in South Iceland and enjoy the scenic drive (~2 hour drive). Arrive at our basecamp in Hvolsvöllur and begin preparing for your trekking adventure. Debrief with your wilderness guides, hear a safety talk, and make any last adjustments to your gear. Enjoy an Icelandic dinner at your basecamp and get to know the new friends you’ll be trekking with for the next week. Rest up! Our epic adventure begins tomorrow. Wake up early and enjoy an Icelandic breakfast at our basecamp. Take included transportation on a super jeep into the Icelandic highlands, where we'll begin our trek! Today we’ll be hiking between 9-12 miles (15-20 km) off the beaten path. Cross a few rivers and creeks by foot, and find your way through a vast valley that leads to our first camping spot. Set up camp with your new friends in our own little section of the Icelandic wilderness. Enjoy the 20 hours of daylight as you take in your surroundings after an epic first day. Come together and help prepare your first dinner in the mountains. Wake up for the first time in nature, and enjoy our first camp breakfast in the Icelandic wilderness. Break down camp, and get ready to hit the trail. Hike between 10-15 miles (16-25 km) as we make our way to our next campsite. We’ll encounter small creeks, mountains, hills, canyons, and valleys with very little traffic. You’ll experience scenery and colors that you didn’t know existed on Earth! Set up camp with your hiking buddies, and get together to prepare your own dinner. Take an optional evening hike for some more breathtaking scenery or just hang around camp and relax. Play some games, tell stories, and hang out in the fresh mountain air. After a filling breakfast in the wild, get ready to enjoy another big day of hiking through otherworldly landscapes. Today we’ll link up with the famous Laugavegur trail, one of the most famous hiking trails in Iceland. Hike over 15 miles (24+ km) as we make our way to Þórsmörk, the Valley of Thor. We’ll cross river gorges, pass glaciers, trek through volcanic desert, and descend into Icelandic forests. Prepare camp in Þórsmörk, where we’ll be staying for the next two nights. Make dinner as a group, and then relax. You deserve it! After three action packed days of trekking, enjoy a relaxing day in the most beautiful valley in South Iceland. 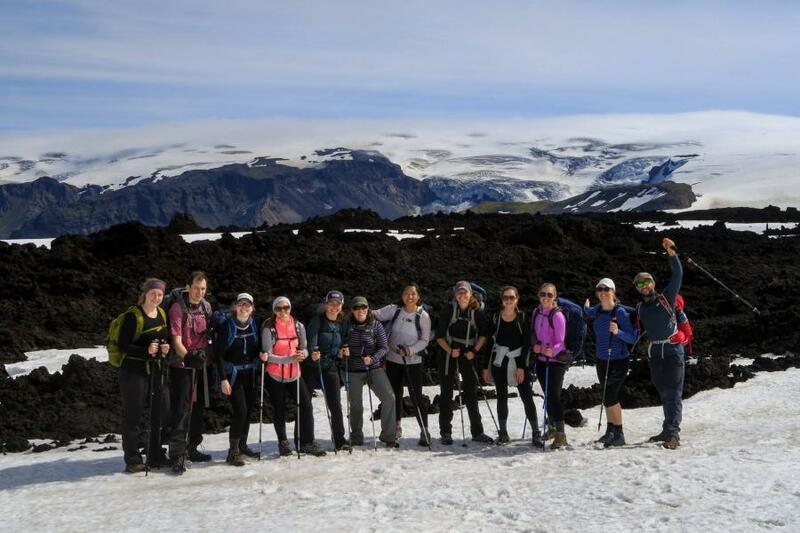 Take in the stunning views from the Valley of Thor where we’ll be perfectly situated between glaciers and volcanoes. 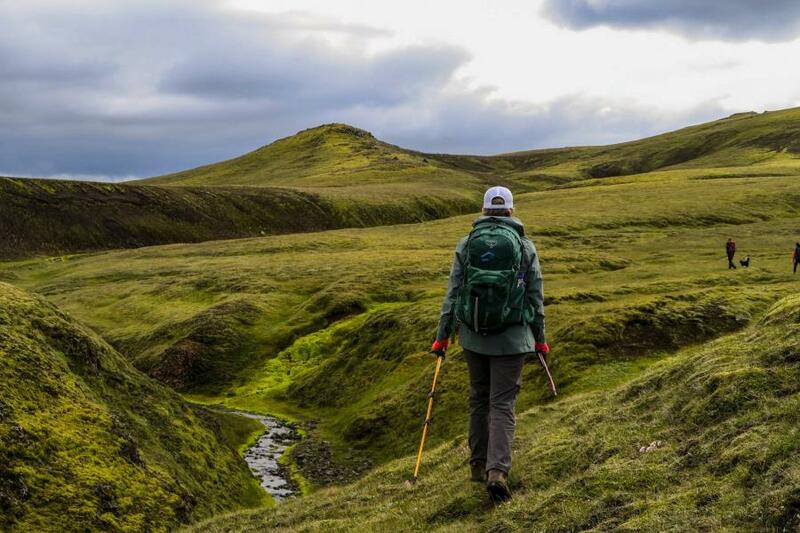 If you want to keep your legs moving, there are plenty of trails and possibilities to hike some more in Þórsmörk. Enjoy our last night in the outdoors by taking full advantage of the seemingly endless sunlight. For our last dinner on the trail we’ll prepare a barbecue together and then enjoy ourselves around a bonfire! Fuel up on our last delicious camp breakfast in the wild. After breakfast, get an early start on the day as we embark on the most challenging day of our hike: the Fimmvörðuhals trail. Begin the hike by climbing up and out of the valley and up between the glaciers. Hike approximately 17 miles (28km) today, as we make our way back toward civilization. Trek between glaciers and volcanoes, and pass by more waterfalls than you can count as we make our way to Skogafoss, one of Iceland’s most iconic waterfalls. Arrival in Skógar means our epic trek has come to an end. After our last dinner as a group, take advantage of the rooftop hot tub and sauna at our awesome basecamp! Celebrate your epic accomplishment with your equally epic hiking buddies. Enjoy a delicious breakfast at basecamp before heading to the airport. If you wish to go to the Blue Lagoon, we strongly recommend you book your tickets online for after 1:00 pm as pre-booking is required. Take our included transportation from Hvolsvöllur to Reykjavik-Keflavik International Airport (KEF) for your flight departing after 3:00 pm.